Moose87 had the most liked content! Hey guys, long time no post. 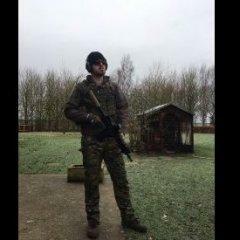 hope everyone is well in the lovely UK airsoft world. Welcome back! Nothing's changed really. they are trying to develop a PEQ version but they need to be able to sell the original first before they can design the newer versions. actually the way they have designed it so that the crack that it emits is done so in a way that the noise doesnt travel long distances and is actually difficult to pin point at distances so that you will know the bang came from a general area but not know exactly where. the bang is equivalent of somewhere close to a .22 but it can be adjusted. having actually been to NZ and used the system i can tell you it is pretty awesome. i was ment to do a write up on it but unfortunately my move to Canada got in the way and it fell by the way side. its a shame as they were stand up guys and the tech was great. its gonna be great when this rolls out. something that airsoft needs. Tutorial on GR16 rewire available? Introducing the UK Airsoft League and a free competition! just curious how exactly does the league work?? what is wrong with people selling second hand stuff!!! they always think its worth significantly more it actually is. Also not aimed at anyone specifically but when something is "new" but second hand it has no recourse with the shop it came from. This is really important. yer i see it all the time and it does my nut. i understand that people put it up a little to get people to make offers for what its actually worth. but i just been looking at stuff and i can see people putting stuff up for the same price as a new one which is a better version. im like wtf? dayz standalone is so weak its not worth it yet, your better of getting Arma 2 and installing all the mods for dayz as i think its more fun and more to do then just run around and collect stuff and then die and repeat. Well I only.play for a few hours in the evening. So I less anyone is up at like 2-6am. Plus I play on north American servers.due to the ping. I will join but dye to time difference here in Canada you guys won't be about. Just attended the remembrance parade at my town in Canada. It's a Holiday in some provinces here. Massive turn out. They still sing god save the queen as well as O Canada. Massive respect to the Canadians, true brothers in arms! Was a really good parade for such a small town. Everyone here really cares. even the local pizza delivery placed a wreath. i mis O Canada, used live there and they sing it so often least once a day. They put us to shame how proud they are. Minimalist Plate Carriers - Flyye FAPC / Emerson JPC? FAPCs are about 100-120 i think. good few head shots in there. Flyye FAPC, im 5'10 and it fit me fine.